sehr schön dichte Stimmung, ist ja richtig idyllisch bei Dir, mitten in der Altstadt? Ja, mittendrin! Haus im Hinterhof. Nur eine Minute zu Fuß von der lauten Fußgängerzone entfernt, aber trotzdem sehr ruhig gelegen. Absolute Stille. nice street to live in! 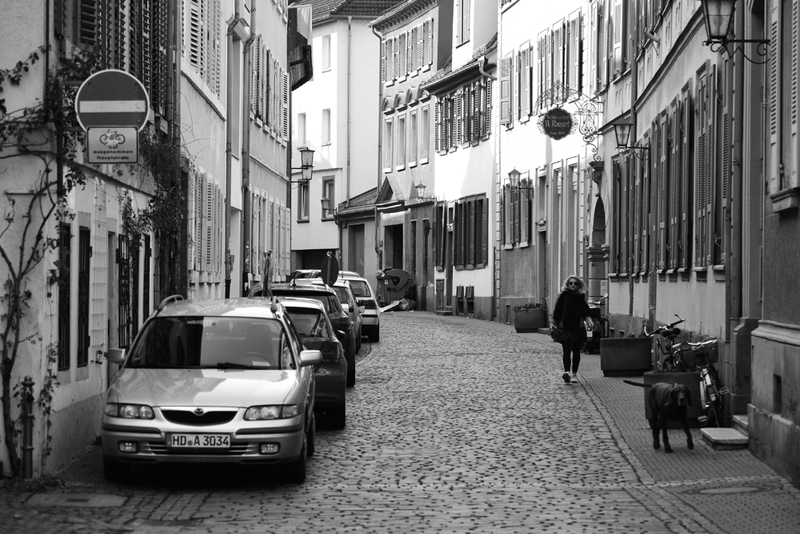 Thanks, but all streets in the old part of Heidelberg look like this. Reminders of the place where I lived in Frankfurt am Main, an apartment block hard up to the streetfront (before we came to Australia when I was four). I’ve lived in apartments virtually all my life, ever since! PS: Is that you in the photo? No, it’s not me – I would not have been able to shoot a self-portrait at that distance. Lovely shot! It’s nice to get a glimpse of where you live.